High Row – free rough parking. 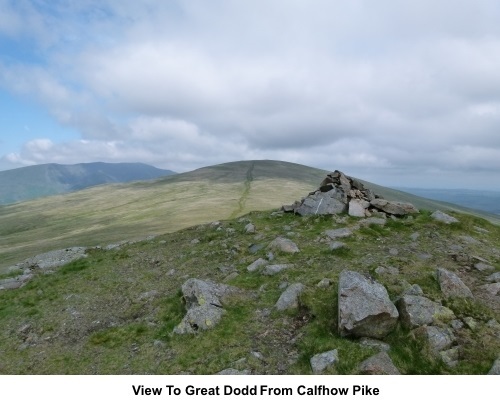 Introduction: I picked this walk because although I have walked Striding Edge and Helvellyn many times, I had never explored further north along the ridge to look at any of “The Dodds”, of which there are three; Stybarrow Dodd, Watson’s Dodd and Great Dodd. Also Clough Head, looking directly at Blencathra, across the valley held the promise of a dramatic view. 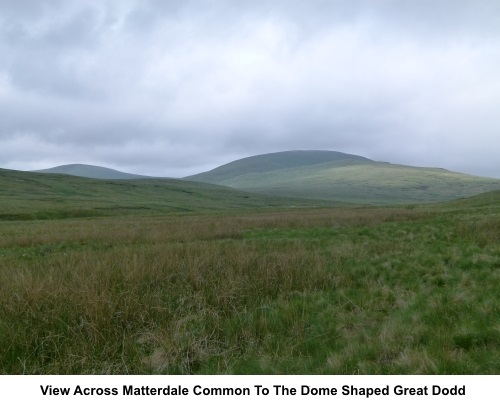 Great Dodd rises to 2812ft (857m) and Clough Head to 2382ft (726m), respectable hills which are classed as “Wainwrights” by reason of being recorded in the great A.W. Wainwright’s writings. 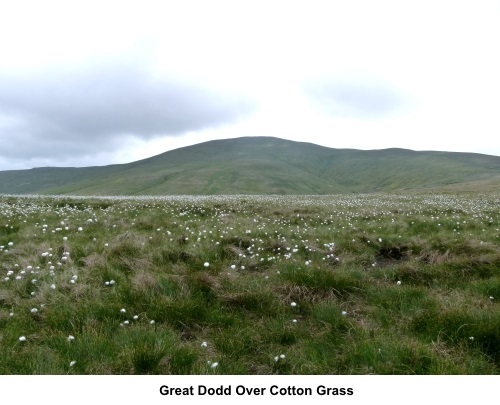 This approach to Great Dodd is a straightforward, easily navigated, mostly grassy path, across Matterdale Common. 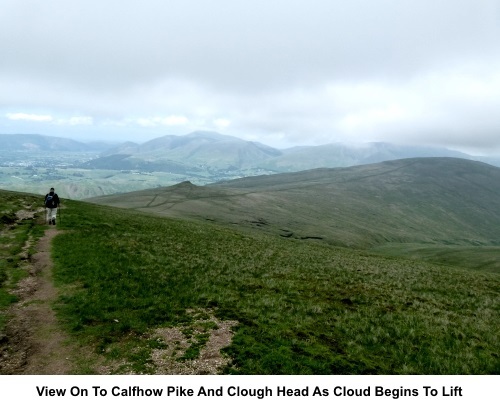 So is the onward route to Calfhow Pike, Clough Head and the descent from Clough Head to the Old Coach Road, although this last part will test your knees! This descent is not shown on the OS map as a footpath. However, this is Access Land and you are free to wander and the path is clearly visible on the ground. 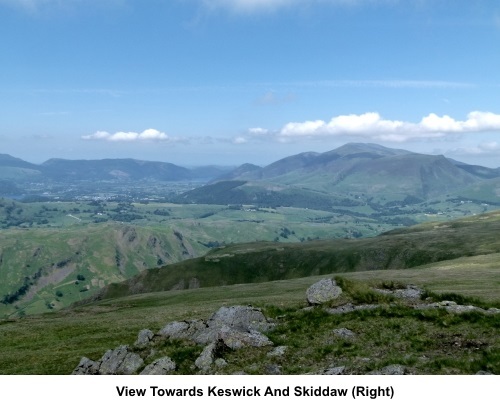 There is no climbing/scrambling or difficult terrain on this walk, so it would be an ideal first time Lake District walk. Only poor visibility on the tops if cloud descends is likely to cause any problems and I include some compass bearings, just in case. I had no view from Great Dodd itself due to cloud but this dissipated as I descended to Calfhow Pike and the vista was then well worth the trip, especially the impressive sight of Blencathra and Skiddaw from Clough Head. There was clear sight of the main Lake District peaks to the west. The walk starts from rough parking at High Row. To get there, turn south off the A66 on to the A5091. At Dockray by the Royal Hotel, turn right on to a narrow lane, signposted “High Row 1 mile”. Follow this for a mile and as it bends sharply left at a junction with another lane, the parking is on the right. The Royal Hotel provides a good “reward stop” after the walk! Start: From the parking (NY 380219), go through the gate following the fingerpost for “The Old Coach Road”, passing a National Trust sign for “Matterdale Common”. The Old Coach Road is a wide stony track and you follow it until just after rounding a bend, cross a stream and turn left on to a narrow footpath following the fingerpost for “Public Bridleway Great Dodd 2½ miles” (NY 374221). Follow the clear path until the ground levels out at a col (NY 348211), where you bear right, beginning the steeper ascent to Great Dodd, going left at NY 342208. The path is very clear on the ground. 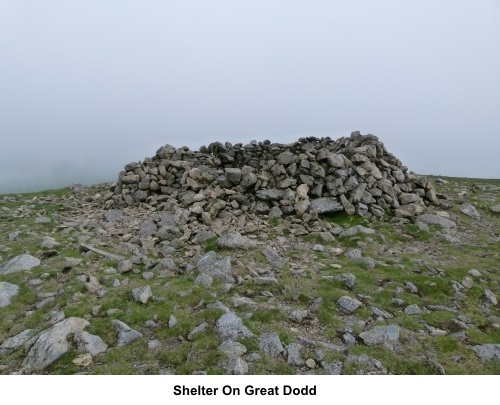 The summit of is marked by a cairn and a crude stone shelter (NY 343205). From the summit, bear right, based on your line of approach (approximately 275° magnetic, curving round to 310° and 315°) and drop down to meet a stony path. 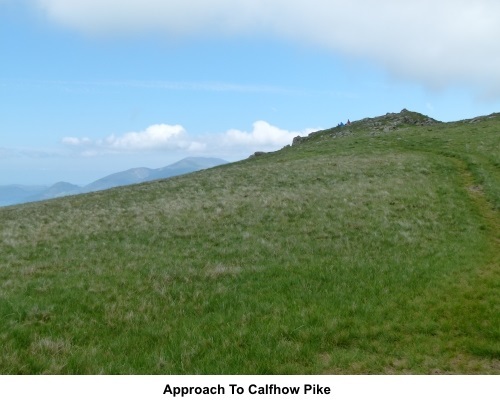 Follow it downhill, curving right to Calfhow Pike (NY 331211). 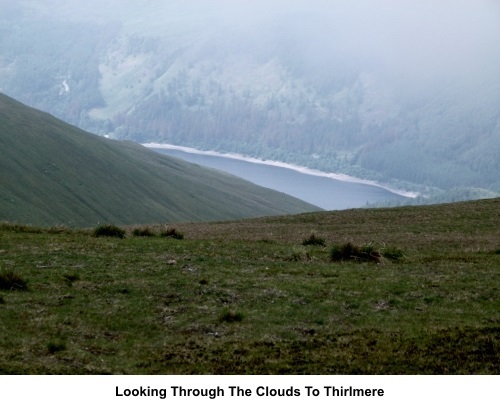 There are views of Thirlmere from here. 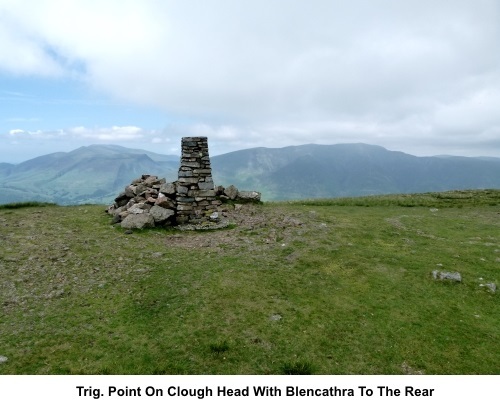 From Calfhow Pike, with your back to Thirlmere, descend the path to follow the obvious route to the top of Clough Head (NY 333225), marked with the trig. point. 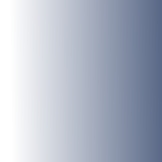 If visibility is poor follow a compass reading of 9° magnetic (30° after a quarter of a mile). From the trig. 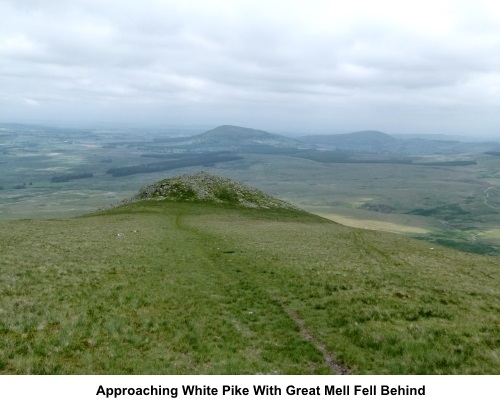 point, continue roughly in the same direction as your final line of approach (initially 30/33° magnetic, swinging to 55° after a hundred yards or so), heading towards the pointed rocky outcrop below (White Pike) (NY 339229). 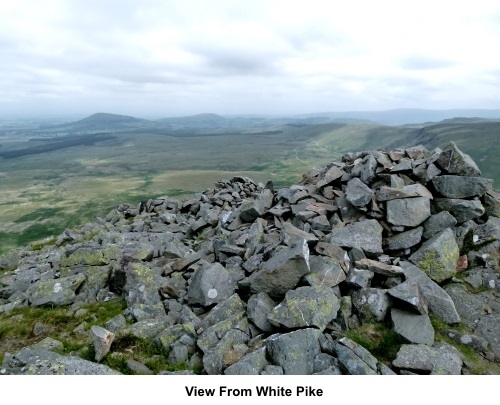 The path drops down to the left of White Pike but it is worth venturing to the top of the stones, for the view. Follow the path down to the Old Coach Road, which should be clearly visible and turn right to follow it back to the parking. It is quite a distance at three miles but it is easy relatively level walking. 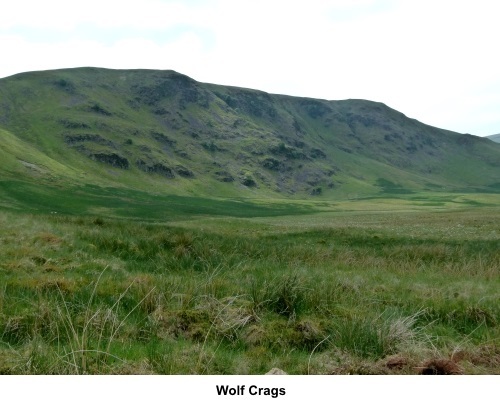 Pass Wolf Crags on the right which can be quite dramatic if the light is right.